Update December 2016: Paper accepted to Global Policy, to be published in 2017. 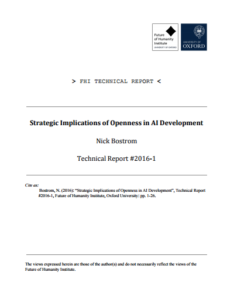 This paper attempts a preliminary analysis of the global desirability of different forms of openness in AI development (including openness about source code, science, data, safety techniques, capabilities, and goals). Short-term impacts of increased openness appear mostly socially beneficial in expectation. The strategic implications of medium- and long-term impacts are complex. The evaluation of long-term impacts, in particular, may depend on whether the objective is to benefit the present generation or to promote a time-neutral aggregate of well-being of future generations. Some forms of openness are plausibly positive on both counts (openness about safety measures, openness about goals). Others (openness about source code, science, and possibly capability) could e.g. lead to a tightening of the competitive situation around the time of the introduction of advanced AI, increasing the probability that winning the AI race is incompatible with using any safety method that incurs a delay or limits performance. We identify several key factors that must be taken into account by any well-founded opinion on the matter.